We can further shorten this musical notation by saying (Red,Green,Blue) = (255, 192, 203). Now you may think that I just made up those particular numbers, but in fact if you check with Wikipedia, the internet standard for color on computer displays has exactly these three values for the color pink. They chose the range 0 to 255 because it is easy to express using 8 bits — which makes computers happy. We live in the computer age, and this (R,G,B) system is now used to define all the colors that you can see on a computer monitor. So, it sounds like color is three dimensional, and you can represent any color in nature (or at least in a photo of nature) using just three colors. But is this true ? These systems are oriented toward luminance-based applications such as TV’s and computer monitors that emit their own light. There are also CMYK (Cyan-Magenta-Yellow-BlackKey) and Pantone™ systems, which are effectively 4 dimensional dimensional and used mostly in pigment-based applications such as printing and paint. 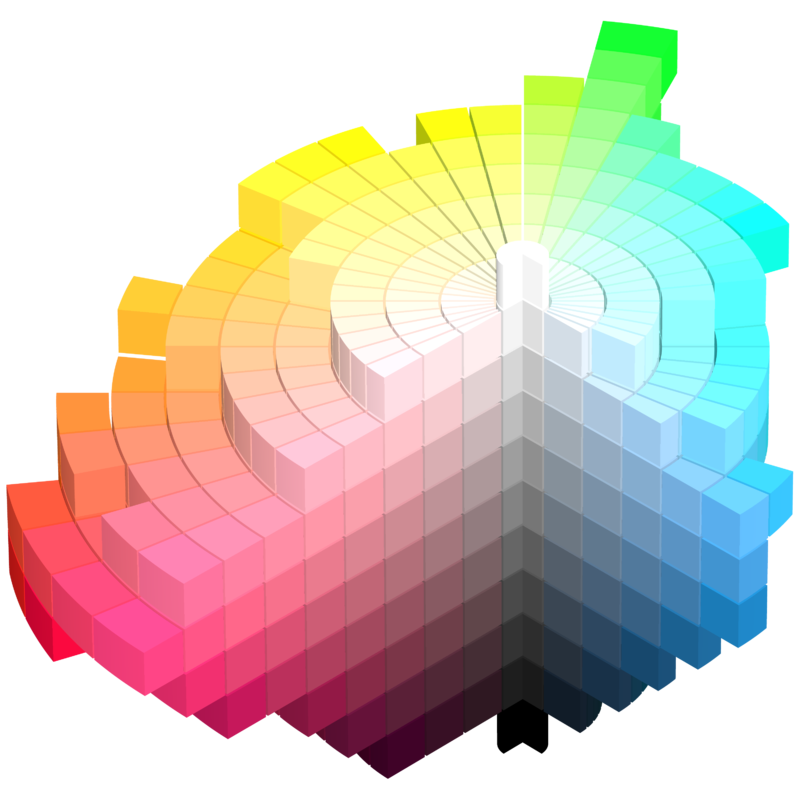 But Pantone also had a six-dimensional version called Hexachrome, which add Orange and Green to form a CMYKOG space (now discontinued), and there is also a CcMmYK system used in six-color inkjet printers. These latter are called “subtractive” systems, because the pigments effectively absorb colors from white light to give you their indicated color. So clearly something must be going on. Why do we even think color is three dimensional, when there are so many color systems using more than three. What’s up? Now this is crazy, because there is clearly a “yellow” key halfway between green and red, and we aren’t hitting that key at all. Instead we are leaning with a strong 255 “forte” on both RED and GREEN. Indeed, in the same Wikipedia entry for Yellow, it indicates that the “spectral” coordinates of Yellow is 570–590 nanometers. This is the wavelength of the light which is colored yellow in the rainbow spectrum. What this says is that we have in our eyes three kinds of cells (not counting rods which detect brightness), which respond to “color chords” that are centered (roughly) around the blue, green and red keys. There is no cell that responds just to “yellow” chords, and so the way that we “see” the yellow color is that our brains get strong positive signals from both the Green and the Red cones. 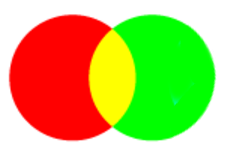 Our retinas will report to the brain that where they intersect it is getting a strong green and red signal, and the brain will interpret that as yellow — even though a light spectrometer pointed at the wall will report that there is no yellow there at all. It is a color optical illusion ! Here is the take-away from all this: the color YELLOW is an IDEA, as are all other colors. It is something unique that our brain thinks — a state of mind — in response to what the outside world is doing. In the case above, the YELLOW our brain “sees” is entirely in our own heads. Now most of the time, in nature, there really is a yellow frequency light wave “out there”, and we know from the yellow in the rainbow that this frequency of light actually exists. You can create a pure yellow by simply dropping salt into a flame (sodium ions radiate at that color). But the idea of yellow must be distinguished from the light that usually triggers it.